This ceramic coffee mug was formerly the property of Mr. Bert Minshall, the captain of John Wayne’s personal boat The Wild Goose. Mr. Wayne often had these mugs custom-made to present as gifts to cast, crewmembers, and friends following completion of many of his films, and presented this mug to Mr. Minshall after completing production on the 1975 motion picture “Brannigan” starring Richard Attenborough. 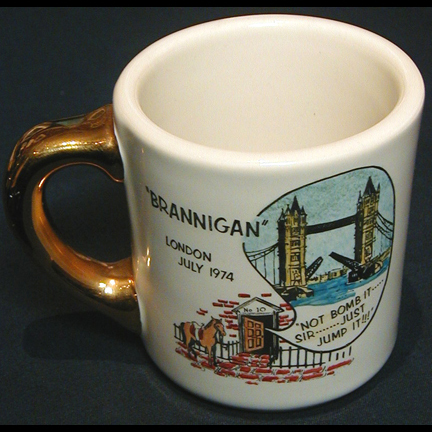 The front of the mug has a Brannigan logo and “London, July 1974”. 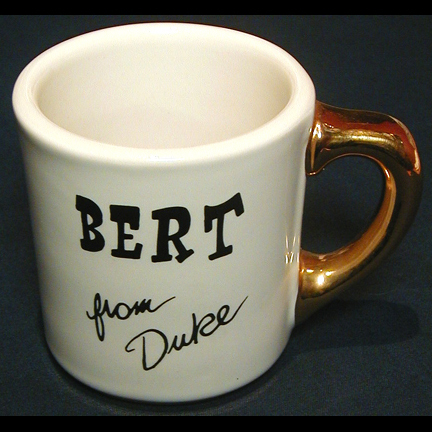 The back reads “Bert, From Duke”. The mug is in very good condition with only minor evidence of wear on the gold painted handle and is accompanied by a certificate of authenticity from the costume house.